In celebration of the 15th Anniversary of the Reunification of Macao with the Motherland, Macao Post will issue a thematic pack under the theme “15th Anniversary of the Establishment of the Macao Special Administrative Region” on that date. This pack comprises 5 series of stamps and souvenir sheets with the significance of the Establishment of the Macao SAR, which included the Establishment of the Macao SAR, the 1st, the 5th, the 10th and the 15th Anniversary. 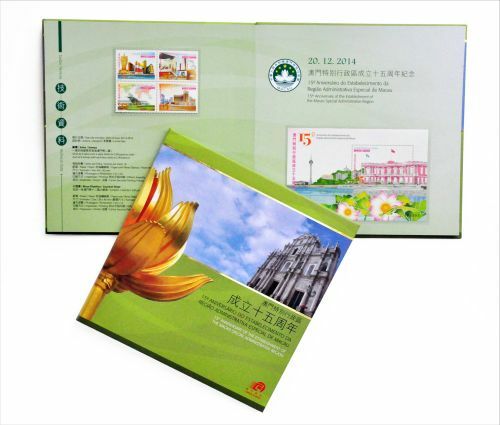 The protective hardcover is illustrated with the images of the Macao World Heritage “Ruins of St. Paul’s”, and the large sculpture “Lotus Flower in Full Bloom” offered by the Central Government as a gift to Macao SAR, it symbolizes the everlasting prosperity of Macao with the support from our Motherland. This pack will be available for sale at the Philatelic Shop of Macao Post Headquarters, “Rua do Campo” Post Office, Maritime Ferry Terminal Post Office, Airport Post Office, and the Communications Museum starting from 20th December, 2014. This pack is priced at MOP195.00, and it is an excellent product, either as a collectable or as an elegant gift.